Jessica Hoffman has been a Licensed Massage Therapist in Ohio since 1997. First graduating from Otterbein College in 1992, with a BA in psychology, in 1996 she decided massage therapy was her calling, and attended Massage Away School of Therapy (currently named American Institute of Alternative Medicine). 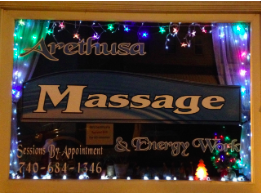 She uses a blend of all of her trainings to meet the needs of each individual massage client. Over the years of working with massage clients, Jessica began to further develop her interests in alternative healing therapies. She now also incorporates Sound Therapy into most of her sessions. Each massage begins and/or ends with the use of Tibetan Healing Bowls. These bowls are placed directly on the body and struck with a mallet. The sound waves penetrate in the the body creating deep relaxation and release of tight muscles. Finally, you’ll enjoy enhanced relaxation with aromatherapy using doTERRA essential oils during your session. Click HERE to contact Jessica via email or call 740-684-1346 to schedule an appointment.